Designed for low- and mid-rise applications, the Cassette system is designed to be used with most variations of 400 Series Curtainwall – CW, T, SS & TU framing for SSG exterior face of 1” glass thickness. This system has no exterior exposed metal, and adapts to an interior sight line of 2-1/2″ using the strength of variable-depth backmembers. Tubelite’s unique glass-to-edge design allows an all glass exterior appearance. Pivot and slide anchor system allows ease of installation. A patent is pending on a number of features on this system. Description: 2-1/2″ x (up to 11-1/4″) shop glazed, screw spline construction cassette framing. 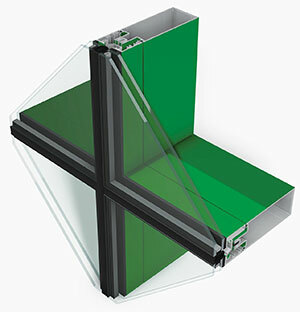 Description: 2-1/2” x (up to 11-1/4″) field glazed, shear block construction curtainwall.